I truly am spoiled living on the east coast, where so much great fresh seafood is available. And really lucky to have a Wegman’s to shop at with a great selection of reliable fresh seafood, much of which is sourced locally. So when I saw fresh flounder on display being hand filleted per order, I knew that would be the perfect choice for dinner. While Lisa likes flounder simply broiled, or stuffed, my favorite way to eat flounder is fried. Crispy crunchy and fried till golden brown…..sigh. Growing up, my father used cracker meal for breading seafood, and I always enjoyed that type of light breading. But for the flounder I was looking for something with a little more body and crunch to it. Regular breadcrumbs just didn’t seem like a good option to me, and then I remembered the box of panko breadcrumbs in the pantry! That was the perfect choice, it actually kept the flounder lighter, not absorbing as much of the oil and added the wonderful crispy crunch that I was looking for! 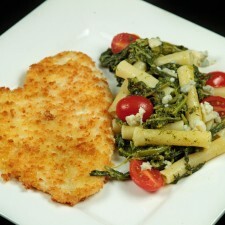 For a side dish, I wanted a contrast to the light and flaky flounder and something with a stronger flavor. 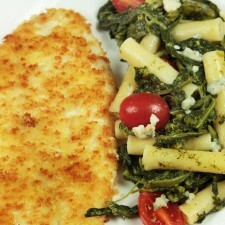 A more pronounced flavor would work to make the fish seem even more delicate and mild. Pasta is always my go to side dish, and by adding in the bitter element of broccoli rabe, it did two things for my entree. It added in the contrast of flavors I was looking for and helped mask any objectionable coconut flavor that may have lingered on the palate. I actually like the taste of Kelapo, but when you’re cooking for someone that doesn’t like coconut; you have to be creative or sneaky! Can I tell you Lisa had no idea I used coconut oil, and even took the leftovers to school for her lunch the next day. That’s always a good sign. When Lisa packs up the left overs for lunch, then she really enjoyed dinner and wasn’t just humoring me. I think you do get used to flavors, and the more you use them preparing foods you love, the easier it becomes. I remember my first experience with olive oil when I was a teenager….I hated it! Then one day I dipped bread into a plate of seasoned olive oil and became an instant convert. I think over time Lisa will get used to the flavor and won’t even notice when I use it. It’s all about balancing flavors. Wash and chop broccoli rabe and place in a small pan with just enough water to cover, place on medium heat until boiling then reduce to simmer. Cook pasta al dente, per instructions on box. Add chopped garlic to a saute pan with two tablespoons of Kelapo over medium heat. once garlic starts to saute, add in broccoli rabe, season with sea salt and add in a pinch of crushed red pepper. Turn down heat and continue turning broccoli rabe in the pan, saute for about 5 minutes then set aside until flounder is completed. Set up your breading station with panko bread crumbs in one bowl, another bowl with the egg lightly beaten with the added water. 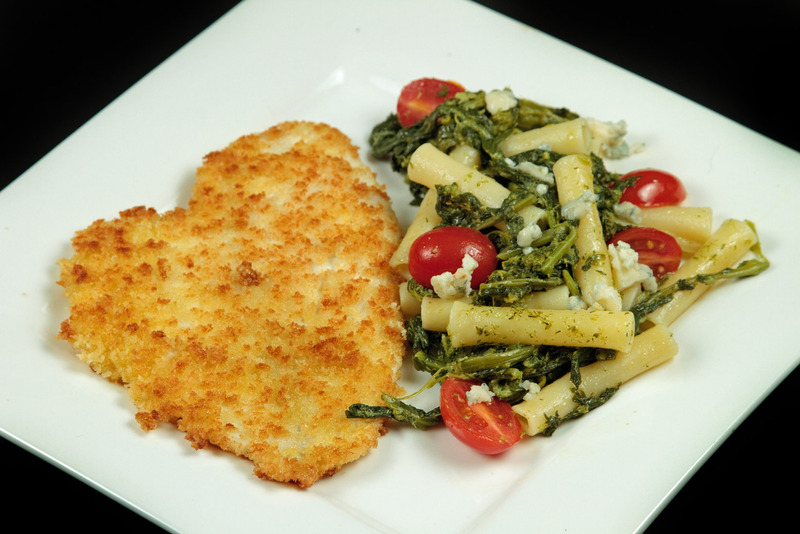 Dredge flounder in egg wash coating the entire fillet, then place in bread crumbs evenly coating both sides. Continue till all the fillets are coated. In a large frying pan add in about 4 ounces (120 g) of Kelapo with heat on medium high. When the oil is hot begin placing breaded flounder into the pan, gently. Do not touch the fish until you are ready to turn it over, about 2 minutes on each side. Continue until all the fillets have been fried. 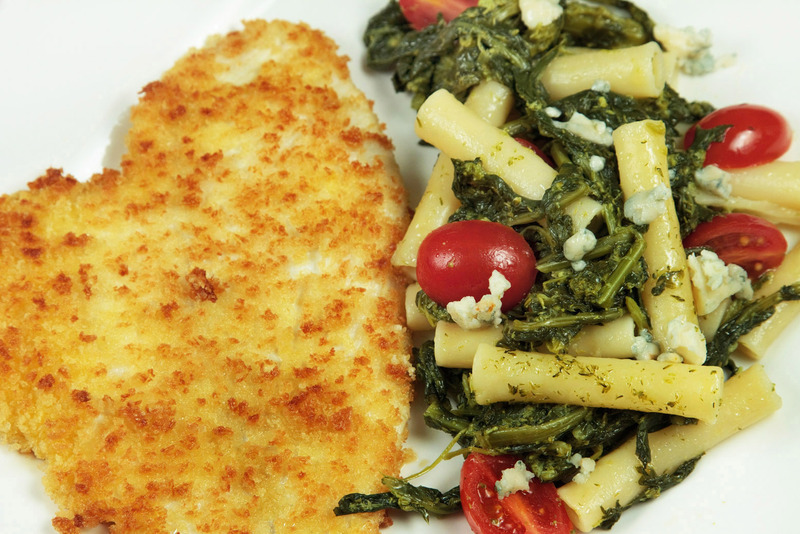 Place fillets on a large pan and place in a 350 degree (177 C) oven for 10 minutes while you finish making the pasta. 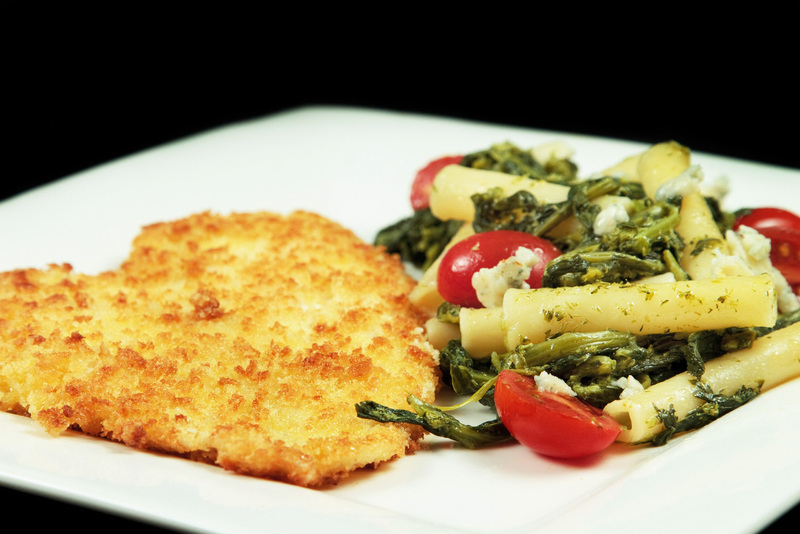 While the flounder is finishing cooking, return the pan of broccoli rabe to the stove over medium to low heat. Add in the pasta, and mix together well. Add in reserved liquid as necessary ( the pasta should not be dry). Add in grape tomato halves and continue heating the pasta for about 5 minutes, reducing heat as needed. 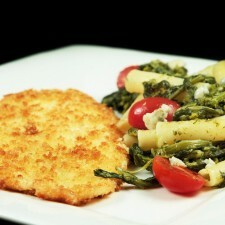 Serve with flounder and enjoy! Thanks for stopping by today. And if you’ve never used coconut oil before you really need to try it. I know it works really well in baked goods, but think about your everyday dishes, and don’t be afraid to push the envelope a bit, experiment and have fun. I would never have believed it worked so well in my Famous Buffalo Sauce if I hadn’t tried it. So get out there and get cooking with Coconut oil! What can you make with Kelapo?